Russia came first in the team competition at the Tank Biathlon World Championship, held at the Alabino Firing Range. Armenia won the silver, while China took the bronze. On Sunday, August 17, Team Russia won the first Tank Biathlon World Championship by finishing the race in 1 hour 15 minutes and 13 seconds. Second place Armenia took 1 hour 20 minutes and 3 seconds, while China won the bronze finishing in 1 hour 30 minutes and 56 seconds. The crew from Kazakhstan, which was almost always in the lead in the finals, at the end of the relay achieved only fourth place, in a time of 1 hour 34 minutes 11 seconds. The rules were based on the traditional biathlon, requiring tanks to race around a track and hit targets. When summarizing the results of the competition, the judges also took into account penalties, the number of which could only be determined via an audit of the race results by means of objective monitoring. 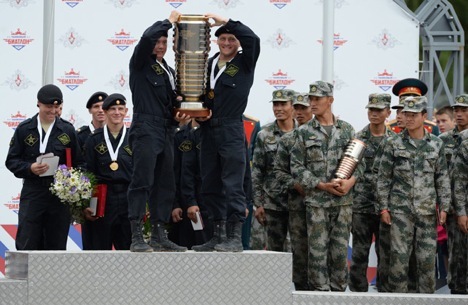 In the individual competition, Russian tank crews took first and second places, while the third place went to a crew from Kazakhstan. The championship started on August 4. Tank crews competed in skillful handling of combat vehicles and in accuracy of shooting at targets with machine guns and cannons. Participating in the championship were representatives of the armed forces of Russia, Angola, Armenia, Belarus, Venezuela, India, Kazakhstan, Kyrgyzstan, China, Kuwait, Mongolia and Serbia. More than 20 countries had sent observers to Alabino. Foreign military attaches praised the organization of the Tank Biathlon World Championship. They promised to send their teams to the next tank competition. “Such competitions provide great experience for all participating teams. For me personally, this is a great experience. I hope that we will learn a lot from this,” said the military attaché of Egypt Brigadier General Khalid Sabri. He thanked the Russian Ministry of Defence for the invitation and organization of this competition, and expressed hope that teams from his country would compete here in the future. Senior Colonel of the People’s Liberation Army of China, Tang Heh Yuan, told reporters that Chinese tank crews are very pleased to have taken part in this championship, and have plans for further cooperation. He also noted that this was a useful venue to test the performance of Chinese-built tanks. This is an abridged version of an article, first published in Russian by Rossiyskaya Gazeta.